Get a great deal by renting the house and the apartment together. Perfect for larger groups or if some of you want your own space. Ask for prices for your dates. 30th April - 1st May, 4th-5th June, 2nd-3rd July, 6th-7th August, 3rd-4th September, 1st-2nd October, 5th-6th November, 3rd-4th December. June and September. A traditional jousting tournament that takes place in the Piazza Grande of Arezzo, which is suitably decorated with shields and pennants for the occasion. There are two tournaments, the first scheduled for June. Later in the year the Lancia d'Oro competition makes up the second event. Giostra del Saracino Web Site An incredibly popular event with both locals and visitors. If you are lucky in the days running up to the event you may catch the practice runs too. 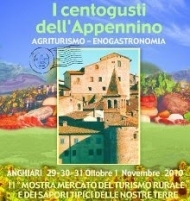 October/November Anghiari hosts this amazing food fair which fills the town with a rich selection of local produce to sample and to buy. A lively atmosphere and a chance to see parts of the town not usually accesable. Locally produced wines, olive oil, biscotti, cheeses, pasta, funghi, preserves etc. July 2016 As part of the Anghiari Festival, the South Bank Sinfonia will once again be performing Choral and Orchestral music at various venues around Anghiari - indoors and outdoors. 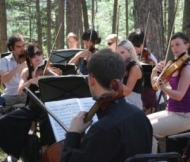 The chance to hear world class music in this magical setting shouldn't be missed. The Southbank even gets a Pizza named after it in the local pizzeria......accolades don't get any greater than that. Piazza Torre di Berta Il Mercatale. End of June. Medieval costumes, processions with drums and heralds, flags, people on horseback and an exciting race which in the case of this palio is for people not for horses. What more could you ask? This fair promotes local crafts from the Valtiberina, filling the historic centre with a wide variety of displays and stalls. The event takes place on the last two Sundays of May. Floats decorated with flowers parade through this beautiful medieval town accompanied by folk groups of dancers and singers. Held in the Piazza Signorelli, Cortona, the competetion known as the Giostra dell'Archidado recalls the wedding between Francesco Casali, Lord of Cortona, and Antonia Salimbeni of Siena, which took place in 1397. One of the most important antique furniture fairs in Europe, housed in the 17th Century Palazzo Vagnotti, in the old town centre. More than 40 specially selected exhibitors featuring furniture, jewellery, tapestry and bronzes. There is also a regular antiques market in Cortona on the 4th sunday of each month from 9am until 8pm. Following the first part of the competition in May, Archers from Gubbio compete with those of Sansepolcro in a tradition dating from the middle ages. Crossbow competition and procession in Renaissance costumes. Takes place in September.